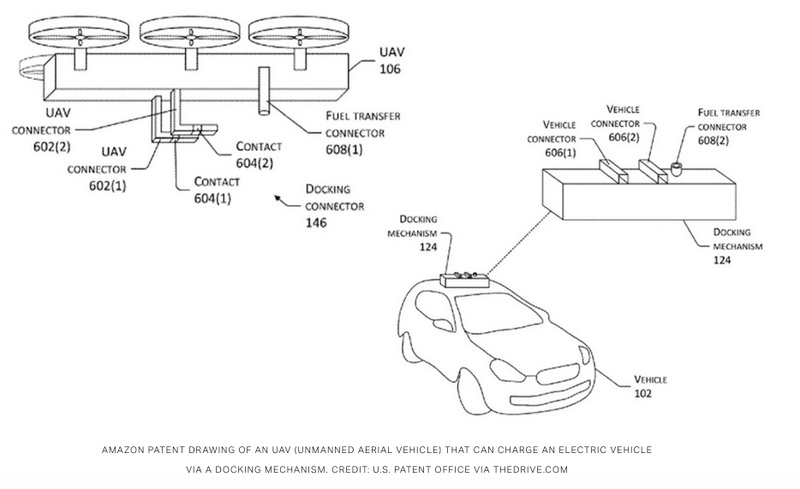 Amazon wants its drones to charge your electric car. Here’s why you won’t need them. Electric cars are on the verge of solving the last challenge they face in competing with gasoline cars — speed of recharging. The race to solve this has gotten so heated that Amazon was just granted a patent to use its drones for charging. Note 1. But long before anyone lets Amazon try to dock battery-carrying drones on their car’s roof, it seems likelier that one or more emerging fast-charging technologies – some as quick as five or six minutes — will solve the problem. Note 2. That’s particularly true because current charging rates are not a near-term barrier to the exponential success of electric cars worldwide, as I’ll discuss. Modern electric vehicles (EVs) have several key advantages over traditional vehicles, like faster acceleration, much lower maintenance costs, and zero tail-pipe emissions. And because EVs are so much more efficient than gas-powered cars, they are the only alternative fuel car with a much lower per-mile fueling cost than petrol cars — even when running on carbon-free fuel. 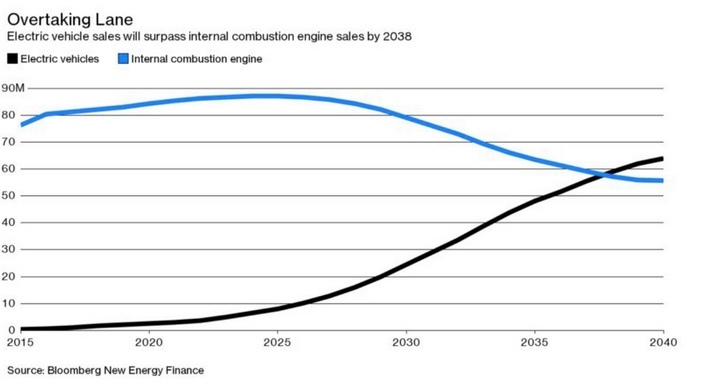 As soon as the fast-charging problem is solved, electric cars will match or beat gasoline cars in every respect, ensuring the century-long dominance of vehicles powered by liquid fossil comes to an end. Until very recently, the barriers to EVs becoming mass-market cars were primarily due to expensive and bulky batteries: high initial cost, relatively short range, and recharging that took hours. But thanks to smart government policies here and abroad — including a big bet by President Obama’s Department of Energy (DOE) on a once-obscure Silicon Valley start-up named Tesla — we’ve seen both rapid drops in battery cost and dramatic improvements in battery performance. These smaller, cheaper batteries are the key reasons EVs are now being embraced [Note 3] by all of the world’s major automakers — and countries like China, India, the UK and France [Note 4] are actively planning to ban gas-powered cars. One major result, as the lead author of a GTM Research report on EVs explained, is that “a price and energy cost analysis of conventional, hybrid, and electric vehicles illustrates that the EV has the lowest lifetime cost, even in a low-oil-price environment” (emphasis added). 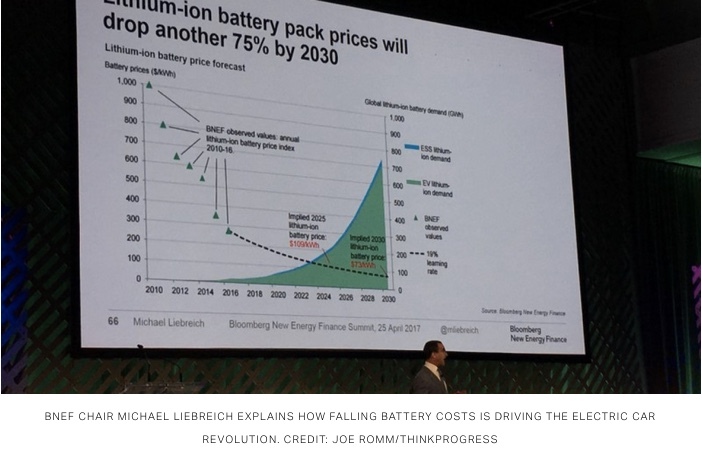 (Note 5) Indeed, with the ongoing rapid price drops for solar and wind power — and batteries — both the initial cost and the lifetime cost of EVs will continue to decline for decades. Note 6. Another major result is that we have seen multiple EV models introduced already with a range greater than 200 miles on a single charge. Tesla’s new, lower-cost Model 3 is being introduced with a 315-mile range and multiple car makers, including Tesla, have announced plans for a 400-mile range. Note 7. Unsurprisingly, charging stations are popping up everywhere. In 2016, the UK Guardian reported “every new or refurbished house in Europe will need to be equipped with an electric vehicle recharging point, under a draft E.U. directive expected to come into effect by 2019.” Note 9. Shell Oil, one of the world’s largest petrol companies, recently announced it would soon offer electric charging at its gas stations — and it just bought a major European EV charging provider to help make that happen. So the one remaining challenge for EVs is the speed of recharging. Recharging has historically taken hours, making very long trips impractical, especially when EV ranges were limited. That said, Tesla is already building and installing superchargers that can provide an extended range Model 3 a 170-mile charge in 30 minutes, which is the timeframe of a typical rest stop — or a visit to a shopping mall. Significantly current charging speeds and range are more than adequate for EVs to achieve significant penetration in this country, where over half of households own two cars. Indeed, the average commute is well below 100 miles round trip, so simply charging at home overnight is more than adequate for many cars — even if a second car is used for road trips. Moreover, in the vast majority of other countries — especially the big, rapidly growing markets like India and China — consumers drive considerably shorter distances on average than they do in this country. The idea that you need a car to be able to drive several hundred miles in a single day is relatively unique to Americans. So super-fast charging is not a near-term problem to EV success, but being able to charge quickly would eliminate the last “advantage” gasoline-powered cars will have and be a big selling point in the United States as EVs strive for much deeper penetration in the coming decade. That’s why so many companies are working on the problem, as detailed in this Research Brief by CBI Insights. Note 10. Toshiba says its next-generation battery will allow EVs nearly 200 miles of range after only six minutes. Porsche is working on debuting its Mission E in 2019 with a single-charge range of more than 300 miles and a 15-minute “turbo-charge” that would add another 250 miles of range. That would require a next-generation charger operating at high voltage, but as CBI notes, BMW, Daimler, Volkswagen, Porsche and Ford have already teamed up to build 1,000 high-voltage stations in Europe. In May 2017, Isreali nanotechnology startup StoreDot, demonstrated its “FlashBattery” technology, which it says can be recharged in 5 minutes. One way or another, the charging challenge will be addressed in the coming years, even if Amazon never gets its fleet of flying battery rechargers off the ground. Note 2. “Battery Breakthrough: How Startups, Tech Giants, And Automakers Could Finally Make EVs Go The Distance,” CBInsights (12 Oct 2017). Note 3. Joe Romm, “This stunning statement from General Motors will keep Big Oil up at night,” think progress (5 Oct 2017). Note 5. Olivia Chen, “11.4 Million EVs Are Expected on America’s Roads by 2025. Will the Grid Be Ready?” Green Tech Media (18 Oct 2016). Note 6. Joe Romm, “Stunning drops in solar and wind costs turn global power market upside down,” think progress (6 April 2017). Note 7. Joe Romm, “Tesla Clears Major Roadblock To Mass-Market Success With New Electric Car,” think progress (25 Augist 2016). Note 8. Jess Shankleman, “The Electric Car Revolution Is Accelerating,” Bloomberg Businessweek (6 July 2917). Note 9. Arthur Neslen, “Plans for an electric car charging point in every new home in Europe,” The Guardian (11 Oct 2016). Note 10. “Battery Breakthrough: How Startups, Tech Giants, And Automakers Could Finally Make EVs Go The Distance,” CBI Insights (12 Oct 2017).